The software metric STPTH ("static path count") some times yields an unacceptably worrying figure. The higher the worse, like 6000, which is really bad - signifying a high code complexity. However, is it the code or the formula that's unacceptable? Let's try to find out. The fairy tale of "Hansel and Gretel"
In this fairy tale , when Hansel and Gretel are left alone deep in the woods, Hansel has left a trail of white pebbles (stones) which their parents did not notice. To find home again, Hansel and Gretel just followed this trail. But the next day, they cannot find home because Hansel made the trail of bread crumbs. The birds ate the bread, and the woods became dangerous. They were lost. The first day the woods was not dangerous, the second day it was. Even in a fairy tale the context or trail is important. A child can understand it. So, why should a high STPTH number always be bad? You tell me! STPTH - what is it? STPTH seems to be defined in the now superseded ISO/IEC 9126 Quality Attribute Model . The  Wikipedia article does not mention the sub-characteristic attribute tree: maintainability - complexity - static path count, which  does. The figure is a screen clip from . ..It is very easy to generate code with a large value of STPTH because the algorithm for computing STPTH is simplistic. For example, the addition of a switch construct with 5 branches will add 5 to the value of STCYC but will multiply the value of STPTH by 5. In other words: if then else and switch case code is expensive STPTH-wise. But watch out, there is at least a case where STPTH is not very meaningful: high number is ok. It's worse: the normal figure is high! This is similar to Nejmeh’s (1988) NPATH statistic and gives an upper bound on the number of possible paths in the control flow of the function. The NPATH metric computes the number of possible execution paths through a function. It takes into account the nesting of conditional statements and multi-part boolean expressions (e.g., A && B, C || D, etc.). Nejmeh says that his group had an informal NPATH limit of 200 on individual routines; functions that exceeded this value were candidates for further decomposition - or at least a closer look. Also,  references the real source of it all, namely and article by Brian Nejmeh in 1988 . Each condition is treated as disjoint. In other words no conclusions are drawn about a condition which is being tested more than once. The true path count through a function may therefore be lower than the estimated static path count but will never be less than the Cyclomatic Complexity (STCYC). There are 3 visible synchronization points in this code: lines 08, 17 and 21. 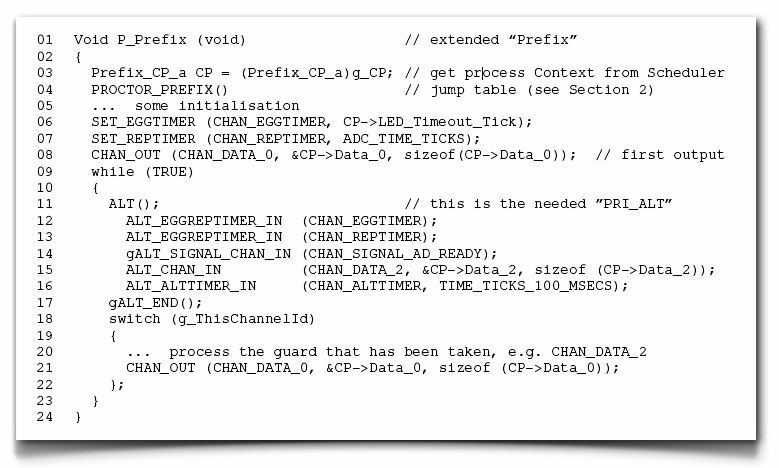 The channel based scheduler is one return away from the code you see here. The PROCTOR_PREFIX in line 04 is an invisible branch table to invisible labels hidden inside the macros of the synchronization points. When a channel (or one of a set of channels in the ALT) is first on the channel, there is a return to the scheduler, to implement the blocking semantics of a synchronous channel based scheduler. This scheduling is called cooperative scheduling, and all the code you see is plain ANSI-C with zero tricks - other than the fact that the branch proctor table is made with a script which searches for the labels. "The channels is the scheduling" with these systems, except for the asynchronous no-data signal channel we have implemented. The Wikipedia article  is not very relevant though, since it does not explain cooperative multitasking in use for a CSP (Communicating Sequential Processes) based system (March '10). Ada could have used that scheme, occam  does, as does our system. These systems could be, and ours is, non-preemptive. Therefore no assembler or tricks, since I don't think it is possible to write a preemptive scheduler in ANSI C without relegating to assembly. I cannot find a suitable Wikipedia article for this. The problem with this code is that it is much more complex than it looks. This inner CHAN_OUT cannot be done from a function! There is no other way, with the non-preemptive cooperative scheduler we use. Aside: it's not as it was with the SPoC (Southampton Portable occam Compiler, ) which generated ANSI-C from occam. Occam allows communication on channels from any PROC (except from its side-effect free functions). So SPoC had to allow it. It used the same return to the scheduler (that's where we learned this). The trick was to "flatten out" any PROC by not calling it, but starting it as a special type of PROCess, only to push the return down (any number of levels) to one above the scheduler. Alas, this is too complex for us to do by hand-written ANSI-C! Still I would argue that the code above is as simple as it could be. In a code example at work, the STPTH value started at 13000, but I was able to reduce it to 6000. Then my willingness to fine tune any more came to a halt. The fact that I took the energy to reduce by 50% showed that STPTH had some value! Perhaps the tool that calculates the STPTH for us could see these inner synchronization points that cannot be put into called functions and "excuse" them? We could decorate that inner point with an exception rule that could enter into the formula. That way we could get STPTH down to some value that we won't have to explain. In the reports we get an overview of all exceptions, so it won't be forgotten. I would certainly like comments on this. How should the exception modify the STPTH formula? After some lamenting to the tool vendors and pondering, we decided to make some conditional compilation #ifdef __STPTH_TOOL__ and remove the PROCTOR_PREFIX's automatically generated jump (goto, scheduling) table and also the synchronization points (channel input and output, gALT_END etc.). Nowhere to jump from and nowhere to jump to! Or, hide scheduling from the tool. The STPTH went from 33 mill to 220 thousand! The file has 2000 lines of code. This is a process file that relates to process context structure that we never parameterize in an extern call. We take elements of it and parameterise, of course. The file is folded, so I only relate to "single screens" anyhow. This is rather good, even if the purists would say the STPTH number is way too high! But look at the structure now. In my opinion it is rather organised. We only placed the #ifdefs in the scheduler's .h file, where all the macros we use are defined. Not a single change in the process files. But we had to rewrite to PROCTOR_PREFIX table generator program to also include this #ifdef in the generated file. 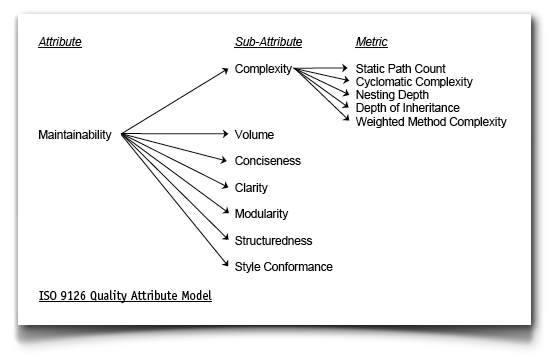 - ISO 9126 international standard for the evaluation of software quality http://en.wikipedia.org/wiki/ISO_9126. - Brian Nejmeh: NPATH: A Measure of Execution Path Complexity and its Applications, in Communications of the ACM, Februrary 1988.